HIGH QUALITY - Soft synthetic leather. Classy gold-tone zipper closure. Detailed streamlined stiching. Full-lined coffee polyster lining. LARGE CAPACITY - Exterior: 2 front zipper pockets, 1 back zipper pocket. 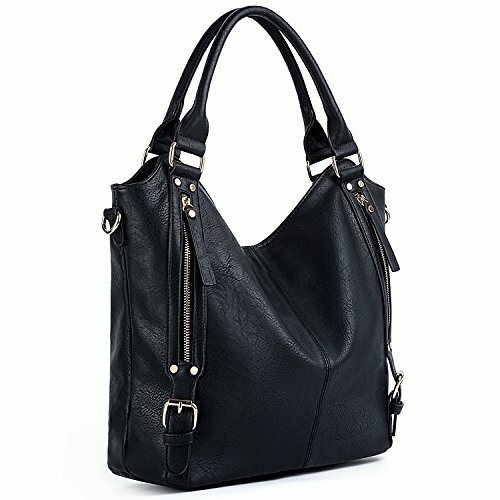 Interior has large compartments with 3 open pockets and 2 internal zipper pockets. EXTREMELY PRACTICAL - Comfortably holds a 13.3" MacBook Pro, tablet or a laptop 14" and under. Pockets can hold your smartphone, cosmetic, hair band, house keys and other tiny items. DIMENSIONS - 12.99"L x 5.90"W x 11.42"H. Weight: 2.23 pounds. Shoulder strap: 47.83". Handle drop: 7.87".